Anne's Food: Finally a decent Mint Chocolate Chip Ice Cream! Finally a decent Mint Chocolate Chip Ice Cream! 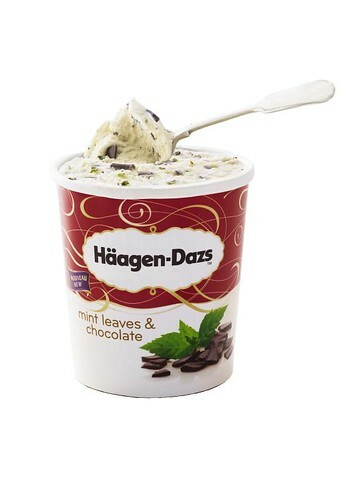 Häagen-Dazs Mint Leaves & Chocolate is a new flavor from my favorite ice cream brand. Mint chocolate chip remains one of my very favorite flavors, and it's quite hard to find here, so I was most happy when I was asked to try this one. It's made with both mint leaves and extract, and it does give a slightly peculiar flavor at first, a little tooth-paste-y... but that goes away. It's delicious - very refreshing and cooling, and the chocolate pieces are also quite good. Two thumbs up! I am sure it tastes divine! Leave it to HD to make a good minty ice-cream!! Lately we've been having GBs päronsplit. Really good with a not too artificial pear taste.